String theory and other new proposals require more than three space dimensions. These extra dimensions could be very small, which is why we don't see them. How can there be extra, smaller dimensions? Think about an acrobat and a flea on a tight rope. The acrobat can move forward and backward along the rope. But the flea can move forward and backward as well as side to side. 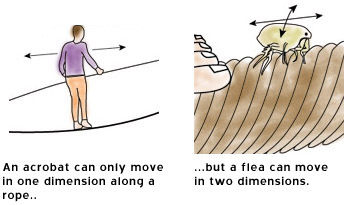 If the flea keeps walking to one side, it goes around the rope and winds up where it started. So the acrobat has one dimension, and the flea has two dimensions, but one of these dimensions is a small closed loop. So the acrobat cannot detect any more than the one dimension of the rope, just as we can only see the world in three dimensions, even though it might well have many more. This is impossible to visualize, precisely because we can only visualize things in three dimensions!